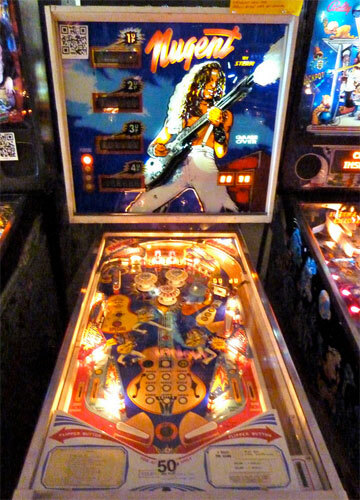 Check out these 1978 Stern Ted Nugent Pinball Machines for sale. You will also find parts and accessories including the LED kit, Ramps, Pop Bumpers, Speaker Upgrade, Flyer, Sound Board, Flipper Rebuild Kit, Fuse Kit, CPU Rom Chip Set, Translite, Playfield Plastics, Target Set, Mods, and Custom Target Decals. The killer backglass shows singer Ted Nugent taken from the cover of his album Weekend Warriors. This is a very rare and sought after game. It's too bad there isn't any Nugent music incorporated into the game like the original KISS. Check the listings below for available machines.